That Obama foreign policy is working out swimmingly, huh? The North Koreans just completed another nuclear test. As predicted in an earlier post – North Korea conducted its third nuclear test today. 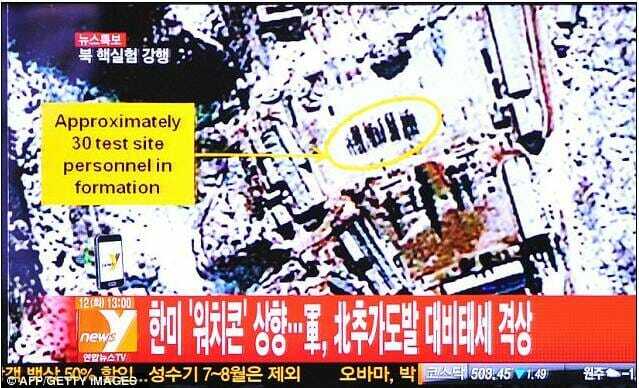 The test took place at the same area as the previous nuclear test in 2009. North Korea successfully detonated a miniaturized nuclear device at a northeastern test site Tuesday, state media said, defying U.N. Security Council orders to shut down atomic activity or face more sanctions and international isolation. North Korea successfully detonated a miniaturized nuclear device at a northeastern test site Tuesday, state media reported. The test blatantly defies U.N. Security Council orders to shut down atomic activity or face more sanctions and international isolation. So much for that 3 A.M. wake up call? The Daily Mail has a time line on how the North Koreans have defied the west with their nuclear ambitions. ** Barack Obama is expected to announce more cuts in America’s nuclear arsenal in his State of the Union Address tonight.